Kurt Masur, music director emeritus of the New York Philharmonic, who was credited with transforming the orchestra from a sullen, lackluster ensemble into one of luminous renown, died Saturday in Greenwich, Conn. He was 88. The death, from complications of Parkinson’s disease, was announced by the Philharmonic. Mr. Masur was the Philharmonic’s music director from 1991 to 2002. When he took its helm, the orchestra was considered to be a world-class ensemble in name only, its playing grown slipshod, its players fractious and discontented, its recording contracts unrenewed. His immediate predecessors — Pierre Boulez, with his cool, cerebral approach and focus on contemporary works, and Zubin Mehta, seen as purveying flash and dazzle at the expense of deep musical meaning — were held more than partly responsible for the artistic decline that had followed the epochal reign of Leonard Bernstein, the Philharmonic’s music director from 1958 to 1969. The selection of Mr. Masur to lead the Philharmonic astounded nearly everyone in classical-music circles. A specialist in the music of Central European composers — notably Beethoven, Brahms, Mendelssohn, Mahler and Bruckner — he had built a respectable if not scintillating career amid the musical and political repressions of East Germany. A shambolic bearded giant who stood 6 foot 3 and favored bolo ties offstage, Mr. Masur may have lacked the dynamism of Bernstein and the avant-gardism of Boulez. But what he could bring to the Philharmonic, the search committee came to believe, were attributes that at the time were even more urgently needed: the respect of its players, before whom he had appeared as a guest conductor; a deep knowledge of the Germanic repertoire that is the foundation stone of the Western symphonic canon; and a tasteful, unswerving fealty to the intent of composers. He could also bring a meticulous if somewhat dictatorial approach to rehearsal discipline, something that New York’s unruly orchestra was widely thought to need. He made his formal debut as the Philharmonic’s music director — in a program featuring Bruckner, John Adams and Aaron Copland — on Sept. 11, 1991. But he had impressed the critics even before his tenure began. Over the 11-year marriage that followed, he would bring to the Philharmonic a restored musical vigor; new recording contracts and regular radio exposure; a populist approach that helped expand its graying, rarefied audience; and a determination to improve the dubious acoustics of Avery Fisher Hall, its longtime home. Though critics continued to tax Mr. Masur for conventional programming, during his tenure he commissioned dozens of new works, from the likes of Hans Werner Henze, John Corigliano, Thomas Ads, Sofia Gubaidulina and Christopher Rouse. He also brought to the podium the ardent conviction that music-making is a moral act that can heal the world. It was a belief he had put into spectacular public practice in 1989, when Communism in East Germany began to crumble and he used his singular renown there to avert mass bloodshed. Mr. Masur would put it into practice again, memorably and movingly, in a New York ravaged by the attacks of Sept. 11, 2001. 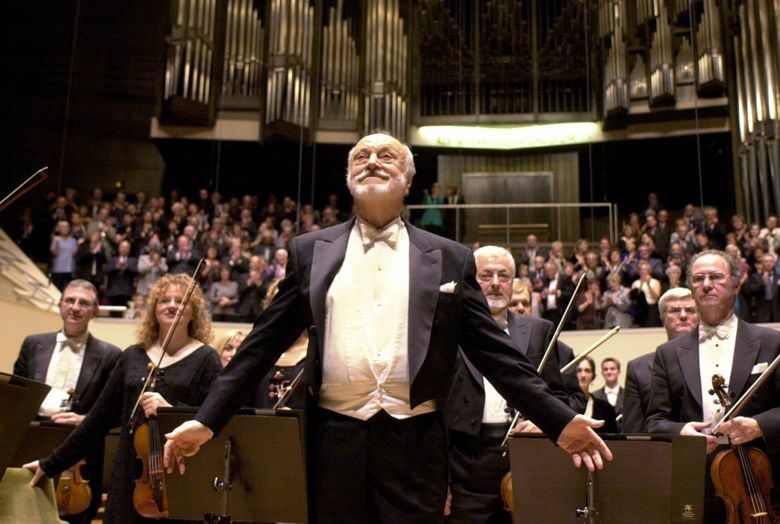 Kurt Masur was born on July 18, 1927, in Brieg; the town, then in the Silesian region of Germany, is now Brzeg, Poland. His father was an engineer, and at his pragmatic insistence young Kurt studied to become an electrician. But he also studied music, training as a pianist, organist, cellist and percussionist while still a youth. Wanting to make the field his calling, he entered the National Music School in Breslau. But by the time he was 16, an inoperable tendon injury in his right hand had made performing impossible, and he chose to concentrate on conducting. (As a result of the hand condition, Mr. Masur conducted without a baton throughout his career.) After the war, in which he served in the Wehrmacht, he studied conducting and composition at the Leipzig Conservatory. After spending more than a decade leading orchestras and opera companies throughout the newly formed East Germany, he became the music director of the Komische Oper, Berlin; he was later chief conductor of the Dresden Philharmonic, a post he held from 1967 to 1972. In 1970 he was named Kapellmeister of the Gewandhaus, one of Europe’s most venerable orchestras. He would hold that post for 26 years. In Leipzig, a city famed as home to Bach, Telemann, Mendelssohn, Schumann and Wagner, Mr. Masur soon became one of the most eminent public figures of any kind. Though Mr. Masur was by all accounts not a member of the Communist Party, his prowess as a conductor gained him great favor with its leadership. He was accorded a comfortable home in Leipzig, and, in an era when an average citizen might wait more than a decade for the chance to buy a Trabant, the East German automobile sold throughout the East Bloc, he drove a Mercedes. He was allowed to travel abroad with the Gewandhaus, which during the 1970s and ‘80s was heard several times at Carnegie Hall in New York. He was also permitted to accept guest-conducting invitations from orchestras around the world, including the New York and Israel Philharmonics; the Dallas Symphony Orchestra, of which he became the principal guest conductor in 1976; the Cleveland Orchestra; and the London Symphony. The popular revolt against East German Communism started in Leipzig, taking hold there in October 1989. Mr. Masur’s immersion had begun a few months before, when he was asked to lend his support to the city’s street musicians, who were routinely arrested for not holding official, government-issued licenses. At considerable professional risk, he convened a meeting at the Gewandhaus, inviting the musicians; the Stasi, the East German secret police; and Communist Party officials — more than 600 people in all. It was a measure of his influence that everyone came, and that a remarkably amicable meeting ensued, with the restrictions on street musicians eased. Mr. Masur would deploy his diplomatic skills even more forcefully in October. That month, pro-democracy demonstrations began in Leipzig’s Karl-Marx-Platz, which the Gewandhaus overlooked. Armed police officers stood ready to meet them. Once again Mr. Masur invited everyone into the Gewandhaus for talks. He recorded a message, broadcast by radio and over loudspeakers, urging nonviolence. Both sides heeded his words, and the day’s events helped set in motion a peaceful nationwide revolution. Mr. Masur’s work was widely seen as having averted another Tiananmen Square. As a result, leaders of post-Communist, pre-reunification East Germany seriously considered nominating him for the country’s presidency. Then came the offer from the Philharmonic. At first, many players viewed his relentless work ethic — and his musical criticisms unsoftened by politesse — as a form of tyranny. What was widely agreed is that the Philharmonic’s sound changed for the better almost instantly. Mr. Masur seated the players on graduated risers, helping them to hear one another, and the audience to hear them. He further blended the sound by moving the cellos from the orchestra’s outside edge to the inside, and the violas from inside to outside. To his work, Mr. Masur brought such energy that in 2002 he returned to the Philharmonic podium just nine weeks after undergoing a kidney transplant. But even this level of commitment did not spare him an escalating, highly public series of altercations with the orchestra’s board, and with its executive director, Deborah Borda. By all accounts, his clashes with Borda centered less on substantive issues than they did on a power struggle between two strong-willed personalities. Tensions with the board seemed rooted in its perception of Mr. Masur as hidebound, dictatorial and perennially hostile to American music. In 1998, the board announced that it would seek a successor to replace Mr. Masur after the 2001-02 season. (Borda left the orchestra in 1999 to become the managing director of the Los Angeles Philharmonic.) Mr. Masur, who was succeeded in New York by Lorin Maazel, made plain in interviews that he had not left by choice. His other posts include the principal conductorship of the London Philharmonic, a position he held from 2000 to 2007, and the music directorship of the Orchestre National de France from 2002 to 2008. His first marriage ended in divorce. In 1972, he was at the wheel when his car struck another on an East German highway; his second wife, Irmgard, and the two occupants of the other car were all killed. Mr. Masur was seriously injured. No charges were filed, and the accident was not widely reported. On his appointment to the Philharmonic, some news organizations in the West and the former East Bloc charged that East German officials had covered it up to protect a favorite son. Mr. Masur, who publicly accepted responsibility for the crash, denied accusations of a cover-up, saying only that he had not been drinking, but had been under great strain, at the time. He is survived by his wife, the former Tomoko Sakurai, and their son, Ken-David, the San Diego Symphony’s associate conductor; his daughters, Angelika and Carolin; his sons, Michael and Matthias; and nine grandchildren. If Mr. Masur was considered autocratic at times, he was not — at least by the standards of his profession — considered egomaniacal. In interviews over the years, he consistently strove to deflect attention from himself and onto the art form he had served for so long.